Whether it was inspired by Susan Feniger's L.A. restaurant Street or spurred by tightening budgets in a down economy or both, the recent conversion of K'ya from a decidedly chic restaurant serving chic food to a chic restaurant serving street food is just the shot in the arm the place needed. 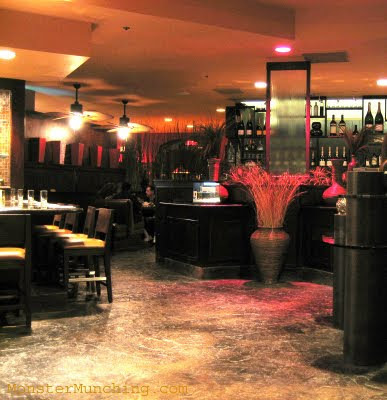 To be quite honest, prior to the change, the three or so times I visited the restaurant inside the too-cool Hotel Menage across the freeway from Disneyland, I've never seen more than two tables occupied -- one of them I'd be sitting in. Now, the leather-tannery-meets-Tiki-room surroundings have actual people in it, all enjoying food served out of paper baskets, using their hands, licking their fingers, having a grand old time. To see how much things have changed, one need only look at the tables. Each has settings of ketchup bottles, mustard, soy sauce, Tapatio and Sriracha, along with a repository of wooden chopsticks. Reading the menu confirms the transformation. Gone are platters costing northwards of $20, now replaced by a list of about 70 items, with nothing over $10, most hovering around the $5 mark. Instead of appetizers, main course, and dessert, mostly everything is, for all intents and purposes, appetizers. Yes, it's kind of like a tapas bar menu. Though, really, that's not accurate either. There are substantial meals to be had here, like a 1/3 pound burger or a Cuban sandwich for $5. Or if you're feeling really peckish, there's loco moco for $6. 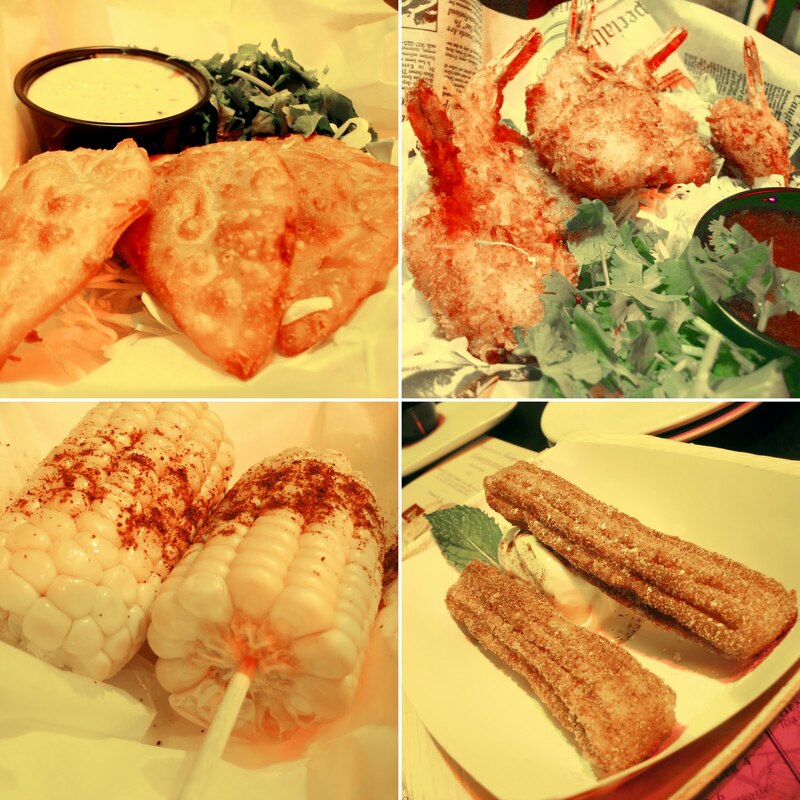 The bulk of the offerings are quick bites intended to emulate what you can grab on the streets of of San Francisco's Chinatown, Ensenada, Tokyo, New York, Miami Beach, Korea Town, Honolulu, Los Angeles, New Orleans, Chicago, Venice, Paris and Bangkok . But be warned, they're not trying to be completely faithful or authentic or even geographically accurate. If you want to get technical about it, you'll notice that some items are spuriously categorized. I mean, when was the last time you saw chopped cobb salad being sold on the streets of Los Angeles? Or chinese chicken salad in SF's Chinatown? Or, most hilariously, a French dip sandwich (which is an L.A. invention) in Paris? You can get nit-picky like this, and it's fun, but there's no denying that perusing the list and picking out nibbles of this and a bite of that is even more so. And the more friends you bring, the more fun you can have. And as I discovered what you pick seems to say a lot about you. Take what I ended up choosing and you'll peg me for a fried foods addict, which wouldn't be inaccurate. First, I took the empanadas, stuffed with slightly spicy cubed white chicken pieces and sporting crust that bubbled and blistered in the oil. There was a tart and creamy cilantro dipping sauce that I used for just about everything, including the crispy coconut shrimp. The latter had a sweet chili dipping sauce of its own, but it was so sugary I heard my teeth rotting on contact. The shrimp itself, however, was nicely fried. The meat still springy, protected by the shaved coconut breading. And for the first time eating coconut shrimp, I can actually taste the coconut flavor. I ordered the corn on the cob as a counterpoint to the grease of the other two dishes, but it was itself drenched in yummy butter, sprinkled with chile powder. A squeeze of lime made it zingy. And of course, I ended with churros -- nicely crunchy outside, mushy warm inside, served hot from the fryer, its radiant heat quickly melting the vanilla ice cream it sat beside. Each stick was caked with an excess of cinnamon sugar and fun, and so is the restaurant. On a particularly brisk Saturday afternoon, in front of a supermarket and looking out serenely at a busy parking lot, two Buddhist monks -- head shaven and bodies all draped in faded robes from shoulder to bare feet -- stand still, calm, and unwavered as oblivious pedestrians come and go, mostly ignoring their presence. A few paces down the sidewalk, a near-toothless old woman in a conical straw hat hawks CDs and newspapers out of a shopping cart. 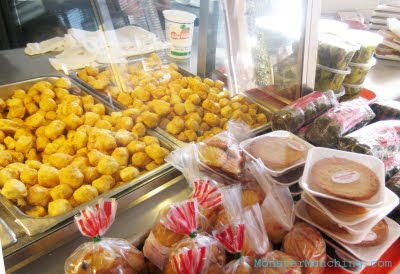 Inside one store, there's a chaotic scene as a glut of people wave with their fists clutching money, trying to get the attention of someone behind the counter so that they can put in their orders for a banh mi sandwich. Further down, there are dimly lit, dank-looking pho shops, where hungry faces hunch over bowls, slurping up seemingly endless streams of noodles into their mouths. Where were we? 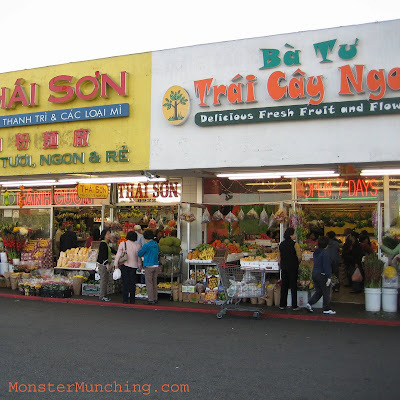 Westminster's Little Saigon, of course. Our destination is a few more doors down. And when we get there, there are two women outside, each from competing stores, yelling at the top of their lungs like auctioneers or snake-oil hucksters, trying to do anything they can to charm passersby into stopping in and buying their wares. What are they selling? Fruit and produce indigenous of Southeast Asia -- all that is weird and wonderful but are otherwise hard to come by the further north you go from the equator. Some are piled in neat pyramids. Some hang above your head in pre-weighed plastic bags. Others, like jackfruit and durian, are both safely kept at waist level. These infamous fruits, sporting spikes as menacing as medieval weaponry, have been known to kill men when they make their free fall from trees. Our quarry? Rambutan, which is a fruit that is as weird as the rest of the lot, perhaps even weirder. 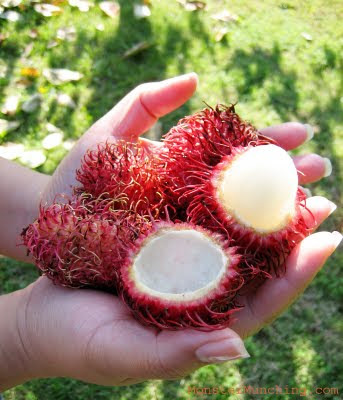 As "rambut" means hair in Indonesian, the golf ball-sized fruit are indeed hairy -- furry, even -- resembling the dangling testicles of a red, alien creature. And since they're in season, we spot the things right away. But only this store had it in stock, and therefore the monopoly. As we made our way in, we feel our shoes stick to the floor like it was covered in old gum, a result of all the accumulated dripped juices from all the fruit that has passed through these walls. "Seven dollars a pound", one woman answers. I gather there's room for haggling, and they probably expect it, but I'm not much of a haggler, so I agree on the price and buy two pounds worth. 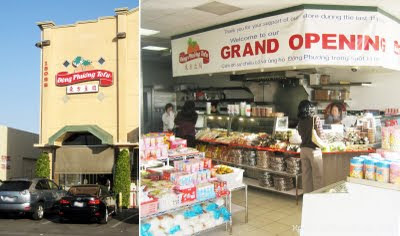 After all, it was only a week earlier that I actually spotted rambutan at Ralphs (that's right, Ralphs) and they were selling them for a $1 a piece. Except those were sad representatives (CLICK HERE to read about that). But these? These were the real thing. Finally! Last year during a trip to Indonesia, Hong Kong and Singapore, we rediscovered them and searched them out like addicts on a drug-addled binge, buying them up from every street corner, every supermarket, where ever we found them, and then gorging ourselves back at the hotel. 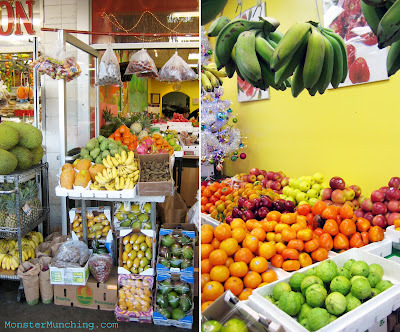 Same as before, we took our locally bought bounty home and ate them with as much gusto. We dug into each fruit with both thumbs after starting them off with a slit made by knife. And like a Russian nesting doll, two hemispheres split and separated. Inside revealed a white translucent flesh. We grab them by our front teeth and pop the whole thing into our mouths, scraping the juicy meat from the almond-like pit. 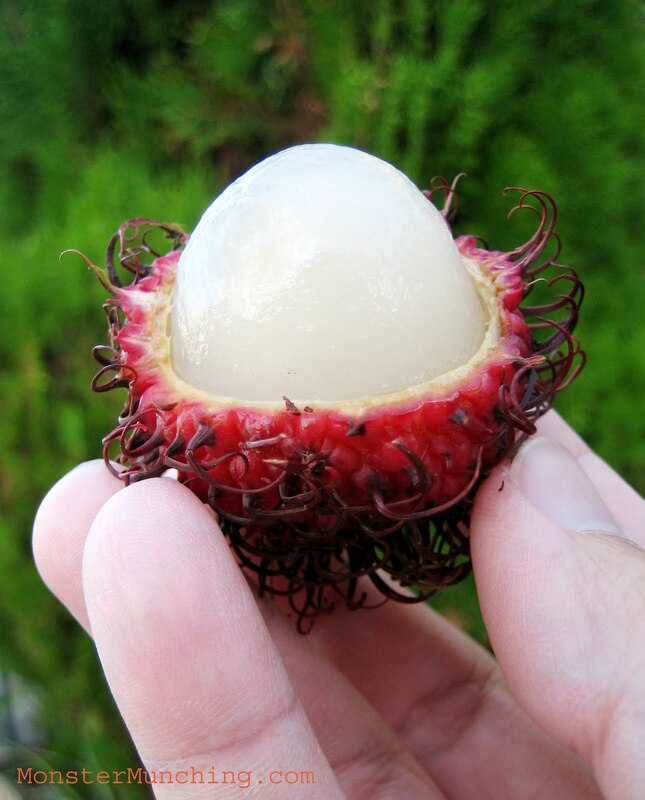 The texture of rambutan, for those who haven't had it, is exactly like a lychee. 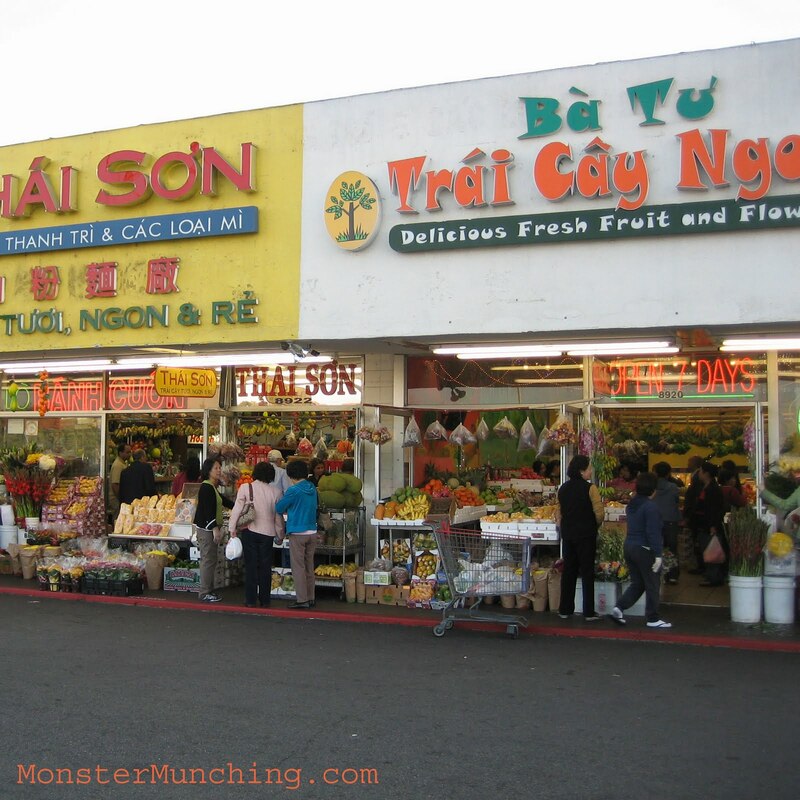 But the flavor is tangier, livelier, just like the Little Saigon street scene I bought it from. *Special Thanks to Das Ubergeek, digkv & Wandering Chopsticks for pointing the way to rambutan! **Special Thanks to brekkie fan for the tip on Asian Tapas. You know those white, brick-sized tofu blocks you see at Asian markets all around Orange County? Ever wonder where they're made? Well, here it is: Dong Phuong Tofu factory in Westminster -- in my opinion, the best supplier of this wonder curd, local or otherwise. When you buy it at a supermarket, the prices are marked up, but not by much. Buying it at Dong Phuong, thereby cutting out the middleman, won't save you more than a few cents. A tofu block will set you back $1.50 here; it's maybe $2 elsewhere. But you should still buy it direct. And the reason is freshness. 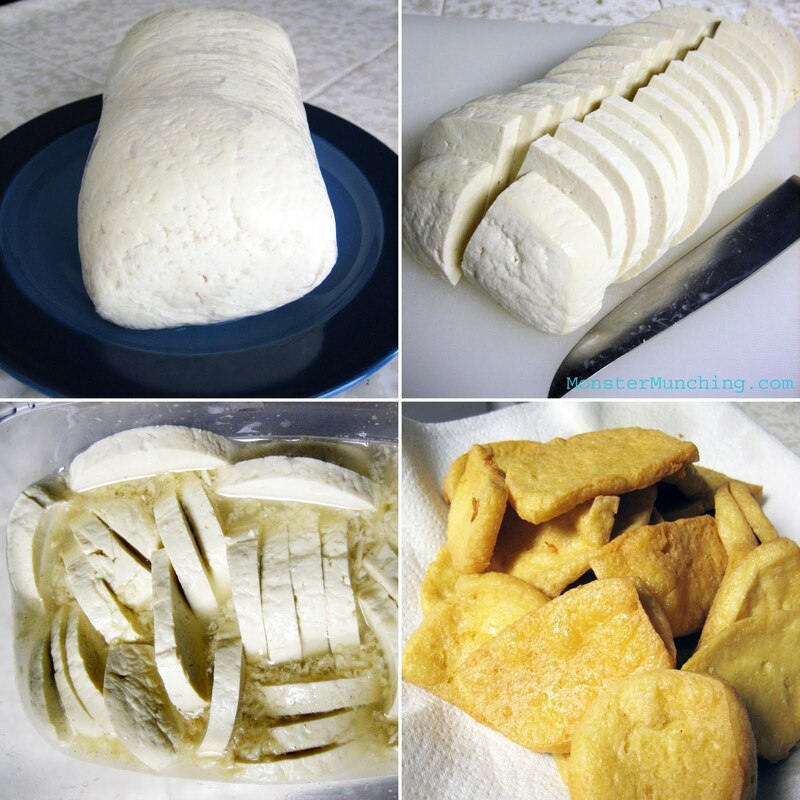 Here, the tofu is not days or hours old, but minutes, sometimes even seconds from the tofu press. It's so fresh, in fact, it's steaming, scalding to the touch, almost virginal in its purity. Some of you are probably wondering, "So if I buy one, what do I do with it?" Tofu is merely a springboard to culinary greatness. Forget about it healthiness. That's a given. It's just a great ingredient. Besides, my favorite preparation is unhealthy at best. I cut the whole block lengthwise and into quarter inch thick slices, then marinade for twenty or so minutes in a salt water brine that has plenty of mashed, pulverized garlic cloves (you can't have too much garlic). After the soak, I deep fry them until they float like rafts and take on a crispy golden sheen. 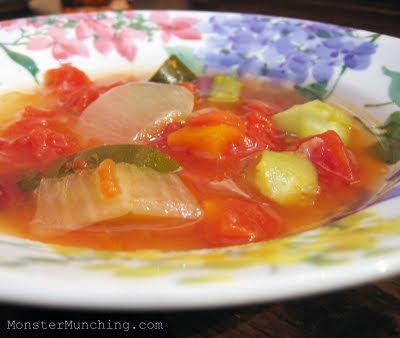 Eaten with rice, maybe some roasted broccoli or other greens, one can call it a meat substitute. I just call it a great and easy meal. Deep frying, by the way, shows off how well-made Dong Phoung's tofu is. The crust gets a bubbly, porous crunch, while the insides puff up to a hollow lightness. The quality is seen in the curd, which has a tighter texture and a more resilient constitution than that of lesser brands. If you're feeling lazy too lazy too cook, you could try their ready made fried tofu cubes ($2.50 a bag), which aren't salted or seasoned, but demonstrates this quality -- all as airy as ping pong balls. And if you're there when they have the sesame balls, don't hesitate. Buy as much you can. The sesame-crusted, deep fried orbs are crunchy, filled with sugary mashed mung beans, and will be the best you'll ever crunch. No, they don't have anything to do with tofu. But they're great just the same. There are days that leave me feeling beat up and defeated, when I don't just need comfort food, but a comfort place. 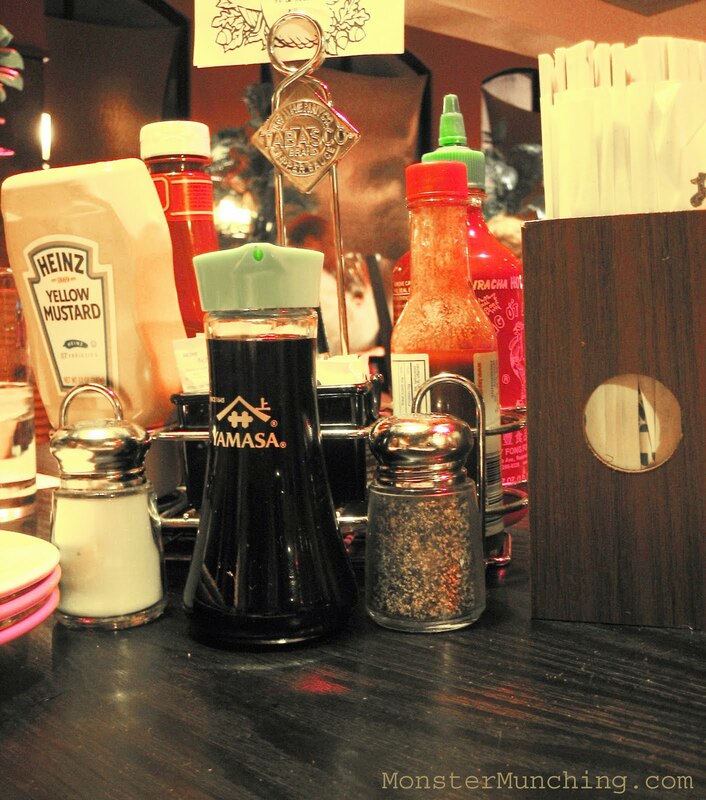 Cafe Hiro is my comfort place. My happy place. A few weeks ago, after one of these days, I told her, "I don't want to stay in tonight." And before we knew it we both said, "Let's go to Cafe Hiro." This would happen two more times in two consecutive weeks. What can I say. It's been that kind of month. But as soon as we arrive, everything seems to immediately get better. Calming and welcoming -- a refuge as a refuge should be -- it's almost as good as home, this place. Knowing that we always order the passion fruit iced tea, our waitress already has it ready. Two tall, ice cold glasses of it are poured, even before we sit down. At the center of it all stands Hiro Ohiwa -- the benevolent owner/chef, a Zen Buddha-figure with a backwards baseball cap -- who waves hello to us as he oversees his dominion. Order tickets go through him before it's fired, and he inspects every plate before it's delivered. If something isn't perfect, he'll make it so. That night he had a surprise for us: a complimentary amuse bouche. 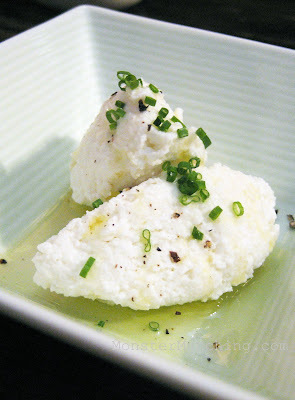 Mozzarella, chopped and formed into two quenelles, sits on a extra virgin olive oil puddle, sprinkled with coarse sea salt and cracked pepper. Just a small token of appreciation, which for me, on that night, counted for a lot. Her choice of main course, as it always is, was the uni spaghetti. 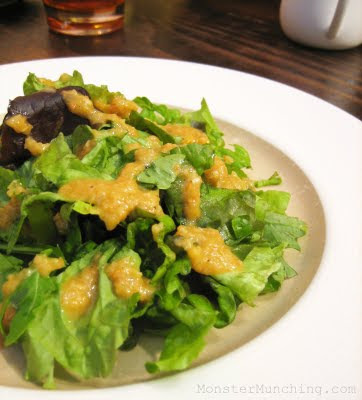 Mine was steak, which comes with a salad and soup -- both gobbled up just as quickly as the salad is briskly cool, and the soup, a liquid-blanket of warmness. Around the plate and flanking the gorgeously browned slab of meat, there's creamy scalloped potatoes fanned out like a magician's cards, but also a welcome bit of greenery: bok choy dappled with drops of miso. And the steak? Of course, it carves like a dream, but also has just enough chew so that there's something meaningful and meaty to masticate. 'Neath it a soy and garlic pan sauce mingles and mixes with the escaping juices. But the garlic part of the sauce means business. It explodes in sweet but powerful tiny bursts. 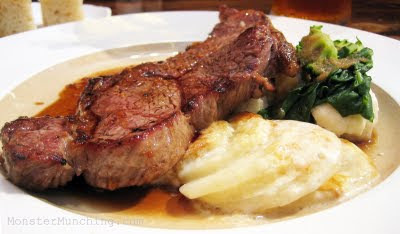 I ate my meal hungrily, as if I were eating the first steak of my life. Good? To me, at that time, it was beyond good. It was more than just a steak; it was soothing balm applied to an open wound. And it isn't fancy like steakhouse's. If I had to describe it, it's more like "mom's house." Cooked exactly to my liking, exactly medium, not too big, not too small...just right. Kind of like Cafe Hiro itself. 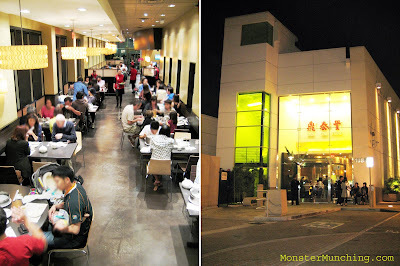 The second location of Din Tai Fung, located within steps of the original, has now been open for more than a year. But as I predicted in a post I wrote about the original Din Tai Fung in Arcadia two years ago, it wouldn't make the lines any shorter. And that's exactly what has happened. At dinner time today, the usual glut of people crammed the original storefront, as well as this one -- its sleeker, spit-polished sister location next door. This isn't my first visit, or even my second to the new digs, which looks as dandy as anything in Beverly Hills. Frankly, I've already lost count of how many times I've actually driven up to Arcadia to feast on their juicy pork dumplings at both locations. At my first time at the new store about a year ago, the staff was still a little wobbly on its feet and the food, slightly off. Figures: it was around opening day when things weren't gelling yet. But look how far they've come. They've matured and matched their master on efficiency. In fact, both restaurants are so efficient, so well-oiled and well-managed, it's nothing short of choreographed. At the hostess podium tonight, a tiny and cherubic Chinese gal about half my height had the confidence and fortitude of an air traffic controller. With a flick of her pen and an earpiece walkie talkie, she kept the turnover going -- hungry people in, satiated out. Hers was a job that required constant vigilance. The typical teenage window dressing would blanche and wither at her station. We were seated in record time: 10 minutes after we arrived. Once settled into our chairs, the first dish came out within seconds. And the next, seconds after that. The minute something was finished, it would be whisked away. Water glasses were topped off without asking. And the food? Identical in every way to what they serve next door. Our juicy pork dumplings, those lovingly crimped pouches, burst with broth. In their spicy beef soup, hunks of tender tendon and long-braised meat swam with spinach beneath a dark, spicy liquid with a red chili-oil shimmer. 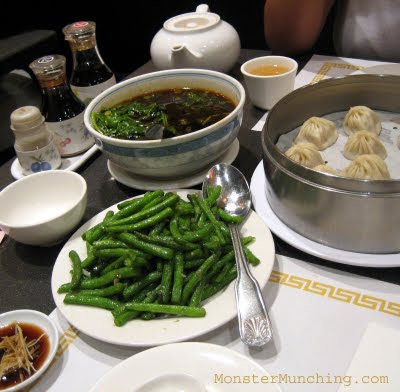 And of course, there was the green beans, which are done in the classic Chinese manner -- a quick hot oil blanching and a toss with garlic. Each spear crisp, snappy, vibrant. No other preparation of green beans is so reverential to its original texture. After we ambled out rubbing our stomachs, we saw our diminutive hostess already sending the next set of eager and hungry mouths to take our place. *Special Thanks to polar for the tip on Myung Dong Kal Guksu.